Movie transcript with snapshot pictures part 7 KRONK: Thanks, Ms. Birdy-poo. GIRL: Yo, crowd, let's get loud! 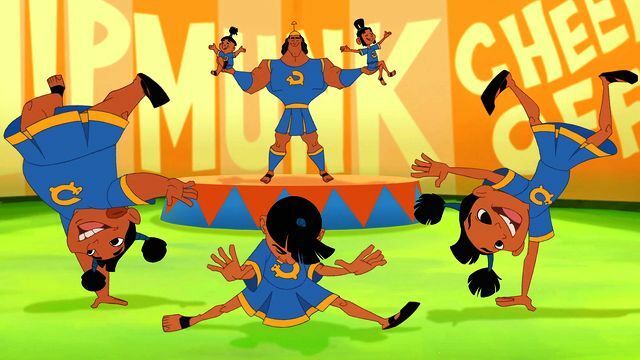 KRONK: Go, Chipmunks! MAN: Awesome! MS. BIRDWELL: Yes! Oh, yay! That was wonderful, Kronky-poo! KRONK: You're gonna be even better, not that it matters who wins. MS. BIRDWELL: We've already won. KRONK: We've already won. 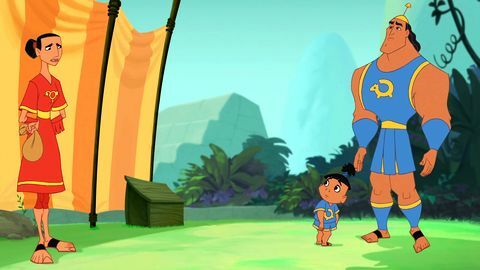 Now I know you're just itching to get out there KRONK: Oh, no. What am I gonna do? IMP KRONK: Eh, let the kid take the rap. He'll do easy time. 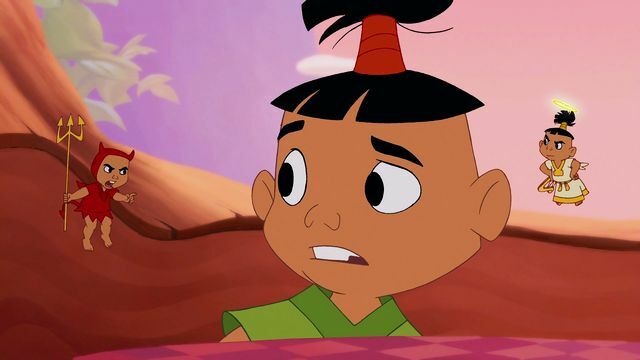 ANGEL KRONK: You put the idea in his head. Look at him out there. He's six. KRONK: Uh-oh. The lip. Not the lip. IMP KRONK: Don't look directly at it! Start flapping your jaw, the girl goes bye-bye. 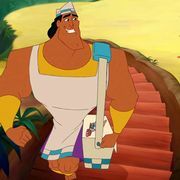 KRONK: Forever? IMP KRONK: Heartbreak City. KRONK: No. ANGEL KRONK: So you're gonna weasel out while they send Tipo off to the big house? IMP KRONK: You forgetting something? You want this, you need that. MS. BIRDWELL: Dangerous. You could have hurt somebody. I cannot believe that you would disgrace the Chipmunk name in this manner! KRONK: But Tipo needs me. Let him go! It's all my fault KRONK: Now I've got nothing. WAITRESS: No, what you've got is a full house on fondue night. Now give me one Havarti party pot two blue cheese bombs and a cracker cheddar surprise. Stat! 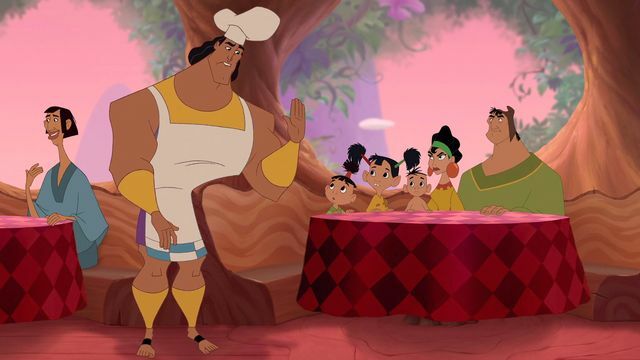 KRONK: How can you think of fondue at a time like this? WAITRESS: Look, you made the right choice. You saved the kid. KRONK: But I lost the girl. Now I'm a two-time loser, and my father's gonna be here any minute. WAITRESS: More like any second. KRONK: Ah! What am I gonna do? WAITRESS: Just tell him the truth. KRONK: I can't handle the truth! Where am I going to find a wife and kids and house on a hill? PACHA: How's dinner coming? I gotta get the wife and kids back to our house on the hill. You want to borrow my house? CHICA: And me? 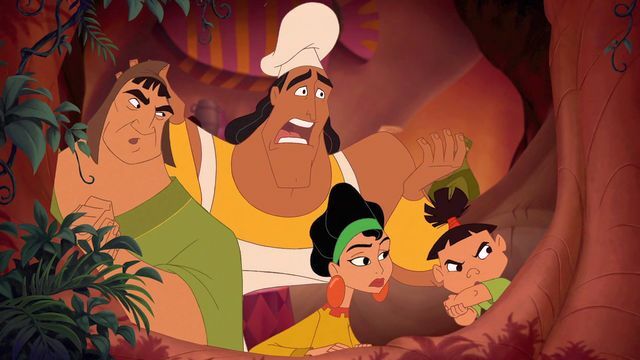 KRONK: And them, if it's no trouble. CHICA: Kronk, you should be ashamed of yourself. 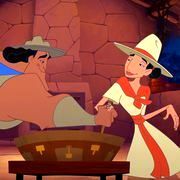 KRONK: Trust me, I am, but not as much as I'd be if Papi finds out I'm a failure. He'll come with everything. Cold Shoulder, Frenzied Eyebrow, Grimace of Doom, Sneer of Despair, Wince of Guilt, Scowl of Impending Wrath, and worst of all, the Nostril Flare of Total Rejection. 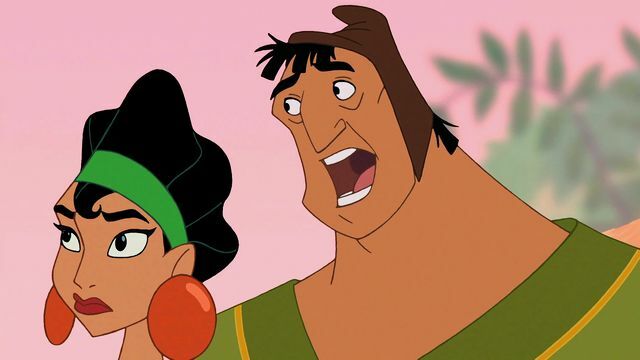 TIPO: What's wrong with Kronk? ANGEL TIPO: Duh, you made him look like a big fat liar in front of Ms. Birdwell! IMP TIPO: Hey, don't guilt-trip the kid! It's not his fault. TIPO: No, he's right. I've got to help him. PACHA: Now come on, Chich, he's our friend. CHICHA: Pacha! PACHA: You saw the Nostril Flare of Total Rejection. We have to do something before his father gets here. CHACA: Too late. He's here. KRONK: Ah! It's him! BOTH: I know what to do! CHICHA: I'll just wait here, like a sane person. PAPI: Kronker? Kronker? Kronker, front and center! KRONK: Yes, sir! Oh! Papi! PAPI: What do I look like, your Aunt Matilda? Put her there! CHICHA: Papi? PAPI: Huh? Oh! Where are your manners, son? 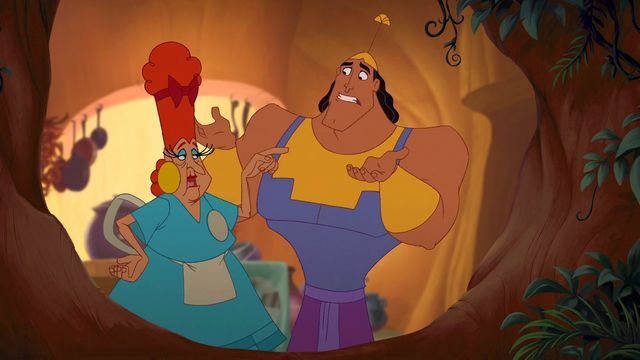 KRONK: Uh, sorry. 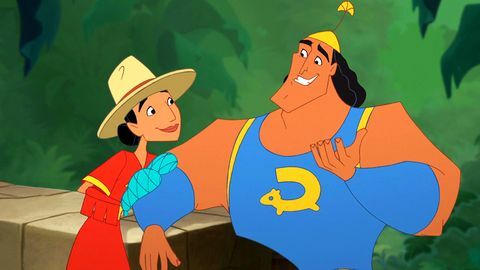 Papi, this is... PAPI: You must be Kronk's wife. CHICHA: I'm, Chicha. PAPI: Chicha. How'd this knucklehead ever land a catch like you? CHICHA: Well, he just asked. Really. PAPI: And these are my grandkids? Front and center, kids, and let me have a look at you. I said front and center! Names and ages! CHACA: Chaca, sir! Age seven and three-quarters, sir! And this is Yupi. He's only a half. KRONK: And, uh, that's my house up there, on the hill. PAPI: Wow! I never thought I'd live to see this. You, of all people, with a wife, kids and a house on a hill. Son, I don't know what to say. 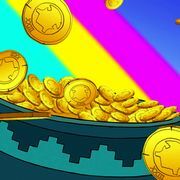 PACHA: Kronkers! Hoo-hoo-hoo! PAPI: Now I really don't know what to say. Who's this... Lovely lady?